The BPJ team is headed to Tampa, Florida for AWP '18! At the bookfair, stop by table T1233 to get your copy of our latest issue, Winter 2018, featuring poems selected by Carolyn Forché for the 2017 Adrienne Rich Award for Poetry. We’ll be offering a generous discount on subscriptions for conference goers, and poet Jacques J. Rancourt will be on hand to sign advanced copies of his chapbook, In the Time of PrEP. 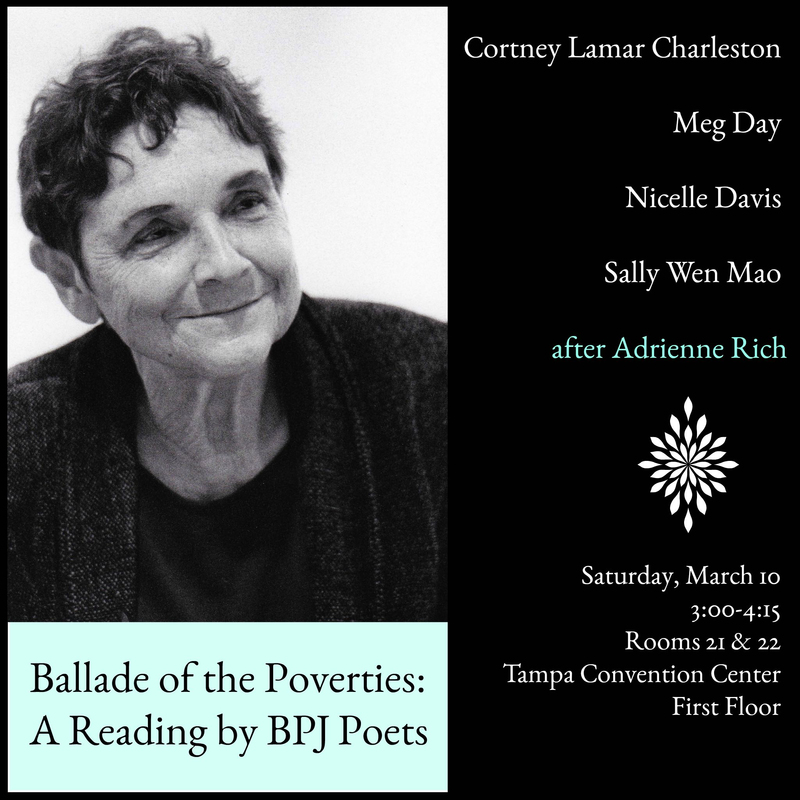 On Saturday from 3:00-4:15, please join us (in rooms 20 & 21 on the first floor of the Tampa Convention Center) for “Ballade of the Poverties”: A Reading by Beloit Poetry Journal Poets. Cortney Lamar Charleston, Nicelle Davis, Meg Day, and Sally Wen Mao will read poems inspired by Adrienne Rich’s “Ballade of the Poverties.” Addressed to the princes of predation and finance, this piece reminds us that political poetry isn’t new or newly necessary but remains a vital force for survival, resistance, and change. Audience members will be invited to submit lines for inclusion in a collaborative response to “Ballade,” to be published on the BPJ website. We hope to see you there!